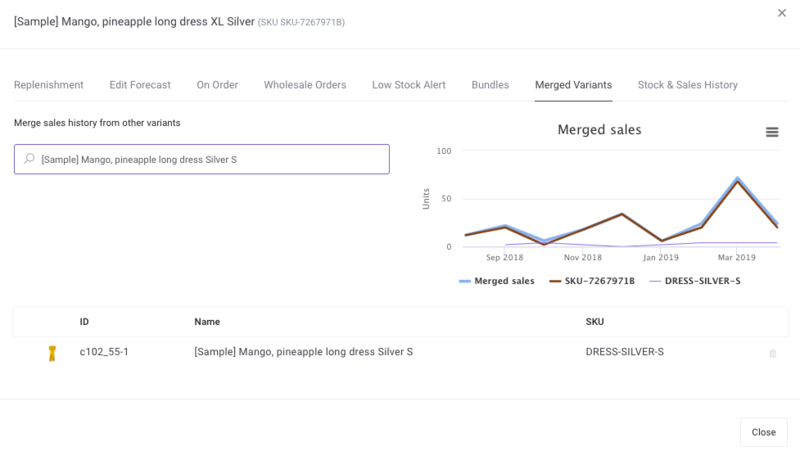 When a product has an updated style or slightly changes sizes, it may be helpful to merge variants so that the new product has sales history needed to create a forecast. In the Replenishment screen, for the new variant click on Details (the bar chart icon). Click on the tab for Merged Variants. Then you'll search for the old variant. Both variants will continue to show as replenishable. If an item is discontinued (a new variant is replacing an old one), then you should set the old variant as non-replenishable. For the new variant, Inventory Planner will pull in sales history of the old variant to create a forecast.